It's heaven's gift to the postcard industry. Even back in Roman Times Portofino was called the world's most charming port. And, 19th century sweethearts called it the perfect romantic hideaway. Portofino's miniscule bay is neatly packed with pricey yachts, common pleasure boats and, as a vestige of its past, some fishing boats. It's lined with multicolored pastel buildings, canopied outdoor cafes and a quay fit for strolling lovers. Portofino's surrounding hills host bougainvillea-garnished villas owned by the rich and famous. Through the centuries the settlement functioned primarily as a fishing village and, occasionally, as a small naval port. 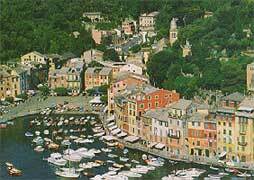 Today, Portofino is a classy and world-famous resort-village. It is blessed with the Italian Riviera's sunny summer climate.